Writing used to be part of children's everyday lives. We wrote letters to stay in touch with friends and relations who lived in other countries, other towns, other streets. We wrote to ask for information and to join clubs. I had a school friend who didn't have a telephone. During the holidays we had to write to each other if we wanted to meet. We didn't think about being 'good' or 'bad' at letter writing. It was something you did because you needed to, like riding a bike or taking the dog out for a walk. Now children do writing at school. It's part of English. 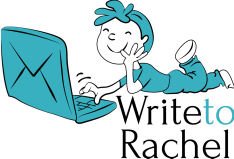 Outside of school they can communicate by phone, by Skype, by text, by all kinds of social media, but they seldom have a reason to write anything more than a few sentences. Then they grow up and they need to write. -- For their more personal interaction with people they need to know how to say thank you, ask for help, or write a letter of apology, or complaint or condolence. They need to persuade and influence and win support. 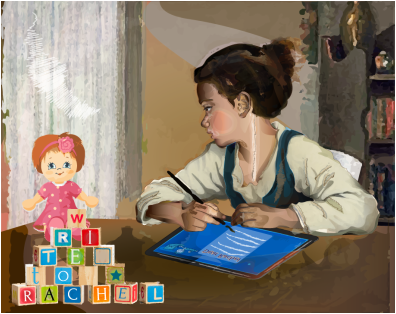 Write to Rachel helps your child, whatever your child's age or abilities, develop the skills that will be important for their success, and evolves with your child as they grow in confidence and capability. Write to Rachel offers your child all the enjoyment of old-fashioned letter writing without most of the bother. There is still the fun of finding an e-mail 'virtual letter' (on the mat, in the mailbox, on the table in the hall -- wherever you like to imagine it), but you don't have to crumple up pages and pages of paper with failed attempts, or queue up for stamps, or dash out to the letterbox to catch the last post. 'As for me, overseeing them to write has never been easier thanks to the computer. No more crossly erasing badly written sentences or misspelled words from their notebooks! As it's very easy to rewrite, I can relax and so can the boys. This is good, especially for one of them...; he now wants to write more sentences and use more colourful and challenging words.. The boys always get on with their letter writing without any complaints. 'L ... is very curious about you and she really likes writing without pressure. It is truly a pleasure for us'.